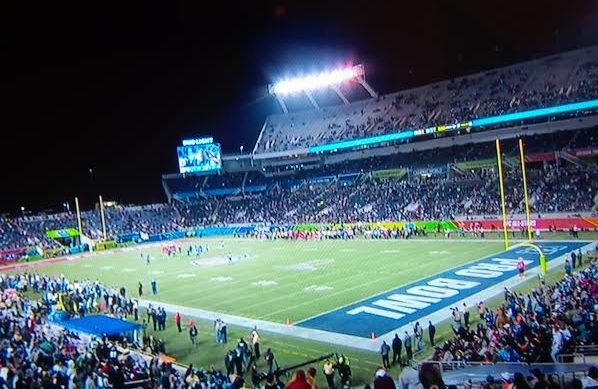 Was the NFL’s Pro Bowl debut in Orlando worth the millions of dollars local officials paid to bring the game to Camping World Stadium? Orlando could not deliver an enthusiastic crowd for the NFL Pro Bowl – at least not a crowd that wanted to stay through the second half of the game. In fact, Orlando couldn’t even deliver warm weather as “chilly Orlando” was a phrase uttered often by commentators. On top of that, this year’s Pro Bowl game was one of the most boring and lowest-scoring in years. It was the first time in 10 Pro Bowl games that neither “all-star” team scored in the first quarter. And in the second half, despite a one touchdown difference between teams, crowds abandoned Camping World Stadium and the NFL early. The whole thing makes Mayor Buddy Dyer’s claim that Orlando could support a professional NFL team laughable. Maybe Dyer should try telling the truth sometimes. The Orlando Sentinel’s Mike Bianchi wasted the ink writing that story. I guess residents should know Bianchi was pushing hot air from the Mayor’s office when he ended his article saying Orlando’s NFL team mascot could be the “Mouseketeers.” It’s like it’s all one big joke to Dyer and his buddies, who seem to be just pushing for the next ponzi scheme in town. Orange County Mayor Teresa Jacobs deserves some blame too, as she was the final piece of the puzzle that guaranteed millions of dollars going to the NFL to bring the Pro Bowl to Orlando. Local tourism tax dollars have already been approved to pay the NFL to bring the game back in 2018 and 2019, but the NFL won’t commit to that yet. The NFL is now likely going to try to get other cities to offer more money and incentives to host the game (which means Orlando and Orange County could likely cough up more money in a sort of bidding war). “We go one year at a time,” NFL Commissioner Roger Goodell told ESPN on Sunday. He must know he can squeeze more money out of our Central Florida community with the leaders we have in charge. 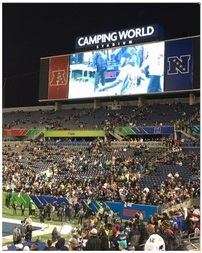 While the Pro Bowl did sell out eventually before kick off, there were discount tickets available all over town. “If the NFL thought it was difficult luring players to Hawaii a week after the Super Bowl, what must the league be thinking after watching what unfolded in Orlando a week before the season’s final real football game?” Ben Rohrbach wrote for Yahoo! Sports. Critics are already saying and writing “send it back to Hawaii” yet our local officials continue to spin their version of how the Pro Bowl’s Orlando debut went down. “Try something new, NFL, because whatever that was on Sunday night, it wasn’t working,” Yahoo! Sports concluded. The Pro Bowl has been a dying game, on its way out with little relevance and little interest. If only local officials like Mayors Dyer and Jacobs cared as much about fixing the problems in our community as they cared about spin, hype and wasting local tourism tax dollars for things like the Pro Bowl. At least the Citrus Bowl got a few shout outs from announcers and others at the event. 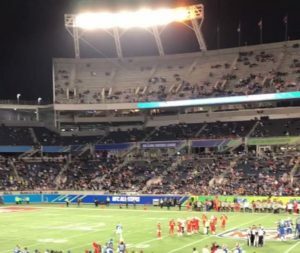 The taxpayer-funded Citrus Bowl was renamed Camping World Stadium after Florida Citrus Sports sold the naming rights for our city-owned stadium last year (and of course, tax payers didn’t get any of the money).